Choose tyre accordingly to your riding style. a) Cross Country riding: both competitive and non-competitive – this kind of riding favours very fit riders and smaller travel full suspension or hardtail bikes. On the basis of the competitive side of XC I would say that an ability to climb up the trail is more important that descending – you can gain way more time by climbing quickly. 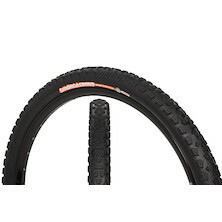 This kind of riding requires a tyre that rolls quickly, is lightweight but also offers a fair amount of grip and traction for technical sections. In terms of width, it usually varies between 1.8’’ and 2.1’’. A tyre with small but tightly-spaced knobs is a good choice as it rolls quickly and still provides plenty of grip. You might want to mount a bigger tyre on the front and smaller on the back. It is a good idea but remember that it will be rolling slower and might slow you down over really muddy terrain. Make sure that your rear tyre is grippy and suitable for the conditions as it will determine your speed and performance on climbs. b) Trail/All Mountain riding: this kind of mountain biking most probably means going out with your mates and it does not usually mean professional competition. In this case you have got way more freedom in terms of tyre choice. What would be ideal here is a multiple-compound and durable universal tyre with bigger knobs ready to deal with rougher trails and higher speed. Why multiple compound? This kind of tyre will provide you with plenty of grip due to softer side knobs compound but will still be fairly fast-rolling due to a harder compound used for the centre of the tyre – best of both worlds! When it comes to width it all depends on what kind of trails are you riding on. Narrower tyre will be faster on smoother and flowy trails and these will be also carrying speed in deep mud with more ease. On the other hand, bigger volume tyre will stay on their line easier on rough and rocky trails. These will give you more cornering confidence and more grip in any conditions. Unfortunately, bigger volume means more rolling resistance but it might be worth trying, especially if you ride in some challenging and rocky terrain, just like the Peak District. c) Enduro/Freeride riding: Modern Enduro and Freeride riding means climbing up a trail because you have to do it to get to that amazing descent at the top. The main task your tyre have to face is to take you down a technically challenging but very fun descent at a blistering speed safely. You do not want to worry about punctures or torn tyre sidewalls. You also want to ride at slightly lower tyre pressures to maximize grip and your confidence. In that case a double or triple compound tyre is a necessity. 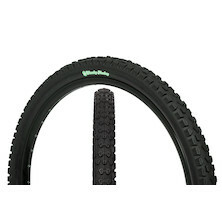 A triple compound one will have harder sidewalls to prevent you from pinch flats and infamous ‘’Snake Bites’’. When it comes to width, you probably want to have a bigger tyre in front that will absorb all the bumps, rocks and help you stay on your line. A smaller-volume rear tyre will be faster-rolling and will be lighter over bigger obstacles. The general idea is that you need grip in your front wheel so that you can stay on your line and the rear tyre, even if it is slightly less grippy, will always eventually follow the front even in the worst conditions. Volume here varies between 2.25’’ and 2.5’’ for the front wheel and 2.2’’ and 2.35’’ for the rear wheel. A perfect setup would be On-One Smorgasbord for the back and Chunky Monkey for the front – it has been a proven and reliable set for almost all weather conditions. Do not always listen to what your mates say. We have mentioned this many, many times and we will do it again – tyre choice is a really personal thing and you need to make sure your tyres suit you, not your best, closest or fastest friends. What works for them might not always work for you! Be aware that price does not always mean performance. If in doubt, get information from many different sources. Make sure you check many different sources when looking for a perfect tyre. See what your favourite MTB magazine reviewer says about them, see how many reviews do these have on online direct-selling websites as well as check the most popular MTB forums. You need to be aware that the vast majority of £20 plus tyres available nowadays are already good quality and we, amateur riders, will not feel that much of a difference between them. Obviously, it is important to have tyres suitable for the riding conditions – more aggressive thread for more aggressive riding and more challenging conditions – but do not forget that it is all about having fun on your bike so make sure your tyre choice allows you to ride as often as you want and enjoy every single minute you spend on your beloved bike! 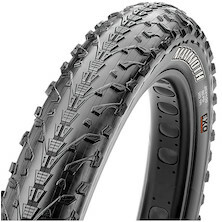 Top spec all-conditions 4" wide, folding Fat Bike tyre from Maxxis. Incredible grip, low rolling resistance and lightweight to boot. 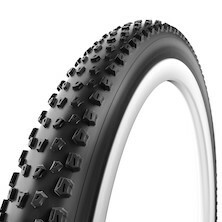 Designed for all out grip, control, absorption this isn't a tyre for XC racers. This is for trail bandits, all mountain riders, and people wanting reliable grip that won't let you down.